Long before sustainability was an over-used buzz word, we were planning both the building of our house and the establishment of the vineyard with sustainable principles as our primary goal. From the outset - circa early 1990s - we were determined to use organic principles and practices to manage the vineyard, and to use recycled materials and energy efficient, climate sensible design to construct the house and (what has become) the tasting room. We succeeded relatively easily with the home building aspect as we engaged an experienced Passive-Solar draftsman and there was plenty of local materials to be rescued from being dumped as waste. The vineyard was another matter as we were (sensibly) advised by John Elliot, then the chief wine guy with the WA Department of Agriculture, to start conventionally to allow the vines the best chance to get established. After a couple of years we then transitioned over to 100% organic production and applied for organic accreditation a few years later - after we were sure we could do it year in, year out. Across our entire property and lifestyle we practice as many of the key activities that underpin improved sustainability - recycling, composting, revegetation and the use of renewable energy - as we can. Murray is very proud of the fact that our typical weekly rubbish output is merely two supermarket bags full - that's for the house and the cellar door kitchen. Everything that can be recycled is, everything else that can't be composted or fed to the chickens is the only thing that becomes rubbish. On the revegetation front, we've planted many thousands of trees on our 20 acres of land. Some act as wind breaks, others for future timber, and the rest along the creek line and amongst remnant bush. As a result of this planting we enjoy a lovely display from endemic birds that now have a habitat in which to grow and prosper, as well as knowing that downstream the creek water quality is benefiting. The addition of roof-top solar PVA panels a few years ago means that for most of the year ALL our energy use is from the sun - a highly renewable form of electricity generation. Growing organically is just one way we are trying to minimise our footprint on this planet, but since 2002, we have been able to grow the grapes according to organic standards. This means that we don't use super-phosphate and other such fertilisers that can leach into the waterways, and we only use a combination of eco-oil, seaweed extracts, copper and wettable sulphur (an allowable input) to control fungal disease. Our flock of chickens and guinea fowl are kept happy gobbling pests, so no pesticides are used either. In addition, we let the grass grow between the vine rows and underneath the wines, so no herbicides are required. This strategy works for us because we have a long, wet spring and the vines have plenty of water so the grass doesn't compete. Without the grass we could experience vigour problems, which means too much leaf growth leading to shading and humidity - conditions which the main diseases just love. The trellising system - called a Smart-Dyson - has enabled us to do without synthetic fungicides, because it opens the vine canopy, allowing sunlight and airflow to minimise the disease pressure. Organic grape growing is about all of this and more. With our goal of crafting unique, terroir-specific wine using practices that care for the earth, most of the work has mostly been done. However, that is not to see we don't value the excellent wine-making skills of Rob Diletti - who received the Winemaker of the Year Award 2014 from James Halliday. Rob and his family own another great regional winery, Castle Rock Estate, where he crafts beautiful wines for themselves and for all of the other small producers like us who use his services. His diligent, dedicated and ethical practices help immeasurably to create great wines, ones that reflect the unique aspects of each location - the terroir - and maintain this region's reputation for wine excellence. When we exclaim with delight at the wines from each new vintage, he modestly claims that great wine is all about the vineyard. We beg to differ! Decades before the term Locavore was first created, we were firmly committed to the "buy local" principle. It wasn't rocket science to see that it is so much better for everyone - the farmer, the environment, and the consumer - for primary produce (or "real food" as Omnivore's Dilemma author Michael Pollan calls it) to be purchased and consumed close to where it is grown. Our early adoption of the Slow Food ethos of eating closer to home meant not only our adoption of Locavore behaviour for our food purchases and consumption, but that Pam was instrumental in establishing the Albany Farmers Market in 2001. 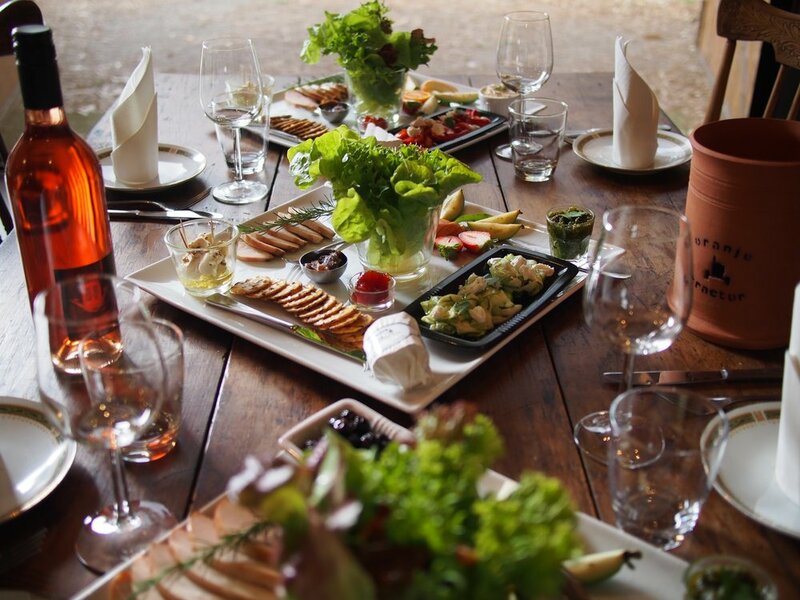 In our tasting room we serve food that is grown, raised or produced within 50km although most is sourced within 50 metres - directly from the garden at Oranje Tractor.